Maybe You Shouldn't Thank This Specific Follower, Patriots? 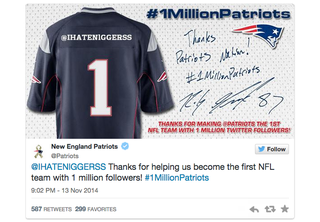 To celebrate the utterly useless "accomplishment" of being the first NFL team with one million Twitter followers, the Patriots are creating custom avatar jerseys for anybody who retweets this tweet. Unfortunately somebody didn't quite think this plan through.